The City of Webster City’s Police Chief is responsible for management of the largest law enforcement agency in Hamilton County and serves a population of over 7,877 people. Currently the police department is made up of 12 sworn officers and a support staff of 10, including a full-service communications center. The Webster City Police Department also plays an active role in SALT (Seniors And Law-enforcement Together), Hamilton County Crime Stoppers, Hamilton County Preparedness Coalition and the DARE (Drug Abuse Resistance Education) program. 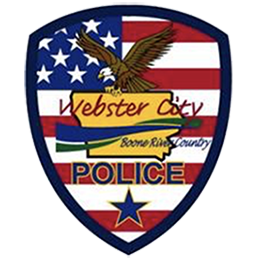 In addition, the Webster City Police Department has a strong relationship with the Webster City Community School District and has daily interaction with students and staff to break down barriers. The police department also currently has an officer who serves as the Cultural Liaison between the Police Department and the various cultures within Webster City. Shiloh was born in Charles City. He is a Certified Peace Officer through the Iowa Law Enforcement Academy and has an Associate of Arts Degree in Law Enforcement from North Iowa Area Community College. He also has a double Bachelor Degree in Criminal Justice and Psychology from Buena Vista University and is currently enrolled in the Federal Bureau of Investigation’s Virtual Academy program. Shiloh has over 20-years of experience in law enforcement, with 18 of those being with the Webster City Police Department. For the last 15 years, he has been an Adjunct Instructor in the Criminal Justice program at Iowa Central Community College where he instruct courses on Criminal Law, Constitutional Law, Cyber Crime, Defensive Tactics, Criminal Investigation and Patrol Procedures. Shiloh and his wife, Corrie, have four adult children. In his free time, Shiloh enjoys spending time with his family and collecting military and law enforcement memorabilia. He also enjoys building custom cars, target shooting and being outdoors. Shiloh is a member of the Traffic Study Committee, Hamilton County Crimestoppers, Hamilton County Sexual Assault Response Team (SART) and Seniors and Law enforcement Together (SALT).